“Building Back Better” (BBB) has been a popular slogan in disaster recovery efforts around the world, including the 2004 Indian Ocean Tsunami, the 2009 Samoan Tsunami, the 2010 Haiti Earthquake and the 2011 Great East Japan Earthquake. BBB has recently been identified as one of four priorities of action for disaster risk reduction globally in the next 15 years by the United Nations Sendai Framework. However, there has consistently been a mismatch and confusion in the interpretation of the phrase and what BBB encapsulates which has made proper implementation difficult and unsuccessful at times. 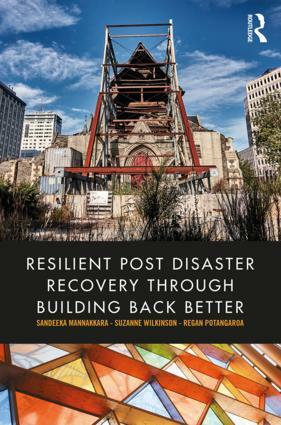 This book explains the concept of “Building Back Better” as an innovative holistic approach to rebuilding a community following a disaster event in order to develop resilience. It begins by exploring the background, development and definitions of BBB. The theory behind establishing BBB as a holistic concept is explained and the internationally recognised BBB Framework developed by the authors is introduced and described. Each of the components of the Framework are explained in detail with findings from international research and case studies from the US, Haiti, Indonesia, Samoa, Sri Lanka, Vanuatu, Gaza, China, Australia, UK and New Zealand, providing practical recommendations for implementation in recovery projects. There is a focus on the translation of BBB theory into practice to assist implementers to use the BBB Framework and BBB Indicators introduced in this book as an effective tool to plan and implement disaster recovery projects. This publication can be used as a handbook by government, non-governmental and private industry practitioners to prepare for and implement post-disaster recovery projects that benefit and strengthen local communities and as a core text on international Disaster and Energy Management courses.